Indiana native and Pacers point guard George Hill models the Hoosiers-inspired Hickory uniform that the Pacers will wear for select games during the 2015-16 season. INDIANAPOLIS -- In a first-of-its-kind partnership, Metro-Goldwyn-Mayer Studios (MGM) and the Indiana Pacers will bring one of the all-time great underdog stories, Hoosiers, to the NBA hardwood, celebrating the film's 30th Anniversary. 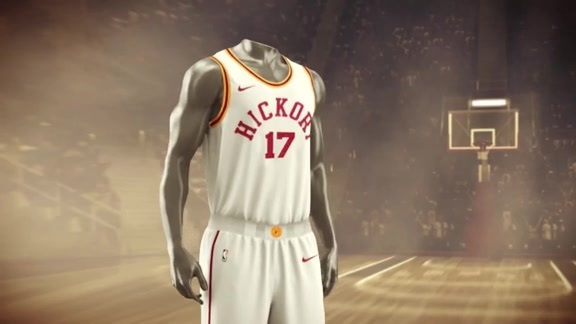 "Our team will be honored to wear the Hickory uniforms because of the attention it will bring to the storied history of Indiana basketball and the success of that movie," said Pacers President of Basketball Operations Larry Bird. "Hoosiers takes us all back to a special place and time." MGM's Hoosiers, which premiered in 1986, was inspired by the 1954 Indiana High School state champion team from tiny Milan. It was written by Angelo Pizzo and directed by David Anspaugh, both Indiana natives, and starred Gene Hackman as Coach Norman Dale. The movie received two Academy Award™ nominations, including Dennis Hopper for Best Supporting Actor, and is widely regarded as one of the best sports movies of all time. Todd Taylor, Pacers Sports & Entertainment's Senior Vice President for Sales and Marketing, championed the idea of wearing the Hickory uniforms and worked with MGM on the partnership. "Obviously, we revere the film, but more importantly we believe our organization, especially our players, embody the core message of the story – by coming together as a team, there is nothing that can't be accomplished," said Taylor. In addition to the upcoming season, the Pacers will wear the Hickory uniform during select games over the next several seasons. Taylor added, "While the uniform being worn in front of a worldwide audience is thrilling, we are equally excited about the additional opportunities the partnership provides both on and off the court. The Miracle Men of Milan are just one of the legendary basketball stories in the state. We look forward to drawing attention to the contributions and accomplishments of those that have made Indiana synonymous with the game of basketball." "With the 30th anniversary of Hoosiers approaching, MGM is excited to partner with the Pacers organization for this perfect tie-in," said Michael Brown, Executive Vice President Marketing, MGM. "We look forward to seeing the players wear the Hickory jerseys with pride." While the central and most visible component is the Hoosiers inspired uniform, the partnership also will allow for a variety of unique community outreach and awareness opportunities throughout the State of Indiana. Details on which games the players will wear the Hickory uniforms will be announced at a later date. About to begin their 49th season of professional basketball in Indianapolis, the Indiana Pacers are a member of the National Basketball Association and the flagship of Pacers Sports & Entertainment which includes Bankers Life Fieldhouse, the WNBA Indiana Fever and Pacers Foundation. The Pacers' core mission is two-fold: winning championships and serving community. Metro-Goldwyn-Mayer is a leading entertainment company focused on the production and global distribution of film and television content. The company owns one of the world's deepest libraries of premium film and television content. In addition, MGM has investments in domestic and international television channels and is the majority owner of and distributor for United Artists Media Group (UAMG). For more information, visit www.mgm.com.